Ethically challenged Alaska governor Sarah Palin has been hit with another ethics complaint by fellow Republican Andree McCleod. This is the 21st ethics complaint filed against Sarah Palin while she has been governor of Alaska. Please consider this ethics complaint charging Governor Sarah Palin for violations of the Alaska Executive Branch Ethics Act. The charges are that she hasn't claimed all gifts received in a timely manner, if at all. (b) Notice of the receipt by a public officer of a gift with a value in excess of $150, including the name of the giver and a description of the gift and its approximate value, must be provided to the designated supervisor within 30 days after the date of its receipt. (f) A public officer who knows or reasonably ought to know that a family member has received a gift because of the family member's connection with the public office held by the public officer shall report the receipt of the gift by the family member to the public officer's designated supervisor if the gift would have to be reported under this section if it had been received by the public officer or if receipt of the gift by a public officer would be prohibited under this section. (E) a parent or sibling of the person's spouse. 9 AAC 52.060. GIFTS. (a) As used in the Ethics Act and this chapter, a gift is a transfer or loan of property or provision of services to a public officer for less that full value. FACTS: Sarah Palin has failed to disclose gifts of significant value received by her and her family as defined in the Ethics Act. Unclaimed gift: White hand-crafted beaded vest received in 2007 In response to my January 22, 2009 public record request for a copy of a completed and signed gift disclosure form claiming receipt of a white hand-crafted beaded vest Sarah Palin received while attending the September 2007 Institute of the North Alaska Dialogue conference in Talkeetna, the office of the governor replied on February 20, 2009 that they were working on generating an estimate of its value. I have yet to receive a completed and signed disclosure form that claims Palin's receipt of a white hand-crafted beaded vest. Final Report on the 2007 Alaska Dialogue (pg 8) 2007 Alaska Dialogue Photo Gallery (PowerPoint Slide Show in pdf format) Unclaimed and undisclosed gifts: Palin/Heath family travel received in 2008 Documents show Sarah Palin and her immediate family have claimed gifts of free travel between the end of August and the beginning of November of 2008. However, other members of the Palin/Heath family, as 2 defined by the Alaska Ethics Act, also received free travel during that same period. 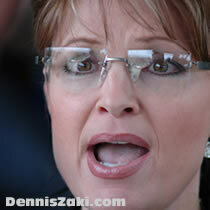 Inconsistently, those travel gifts received by Palin's family have not been claimed. Yes, he advised her - after the election - how to set up a PAC (big deal - it is common - routine - for politicians to set up a PAC - virtually every politician has one set up and there is nothing wrong with them. and incidentally, the PAC was created to pay travel bills she had accumulated and would accumulate in the future and to contribute to other candidates .and the Pac was not to be her chief political advisers which is what the article accuses.) And yes, he thought it wrong the way she was attacked in the media. As a matter of fact, so did I think she was treated unfairly by the media (I don't like gratuitous attacks.issues, yes..but not gratuitous attacks) and I am not the only one who thought that in the media. My husband helped with the PAC - I did not - AFTER the election when she was not running for office but trying to dig herself out from lawsuits, ethics complaints and unfair attacks by the media. Big deal. So he was nice to her and wanted to help her and did help her. http://www.huffingtonpost.com/2009/03/20/greta-my-husband-is-not-a_n_177262.html http://voices.washingtonpost.com/thefix/eye-on-2012/palins-team.html July 18, 2009 Newsweek reports while speaking about official State of Alaska business: (attached) One of the main reasons Sarah Palin is stepping down as governor, say associates, is her large, unpaid legal bill. Her successor, Lt. Gov. Sean Parnell, says she is worried about "the cost of all the ethics investigations and the like." But is that really the reason? John Coale, a Washington lawyer who helped Palin set up a legaldefense fund and PAC, tells NEWSWEEK the fund is "well on its way" to paying off $500,000 in legal debt from the campaign and another $100,000 in bills incurred later, leaving questions about how big a part money woes played in her decision to resign. (Are Legal Bills To Blame) http://www.newsweek.com/id/207398?from=rss Unclaimed and undisclosed gifts: UNKNOWN as per Sarah Palin June 15, 2009 letter (attached) "There are boxes of unopened mail at this point, even mail that was delivered in 2008. Thus, as initially disclosed, 'we continue to open boxes' and we consider any parcel "received" at the time it is opened." The AK Ethics Act mandates that gifts be claimed within 30 days of receipt. More than enough time has passed for these gifts received in 2008 to be claimed. Sarah Palin's blatant disregard for our laws must be addressed as the public's right to know has been infringed upon regarding gifts received by the governor. Sec. 39.52.410. Violations; penalties for misconduct. (2) request the attorney general to exercise all legal and equitable remedies available to the state to seek whatever relief is appropriate. Based on these facts, Governor Sarah Palin violated the AK Executive Branch Ethics Act by not claiming and disclosing gifts properly or timely. We deserve to know who plied their governor with gifts. The scope of the ethics code states that each public officer holds office as a public trust. For Sarah Palin to intentional and willfully hide those gifts is a violation of that trust. To blatantly refuse to comply with Alaska ethics and public financial disclosure laws and is a travesty. I'm requesting that this complaint be forwarded to the Alaska Personnel Board. Thank you for your prompt attention. Please don't hesitate to contact me with your concerns.